This post is part of a hosted stay in Vermont. All opinions, writing and photographs are my own. 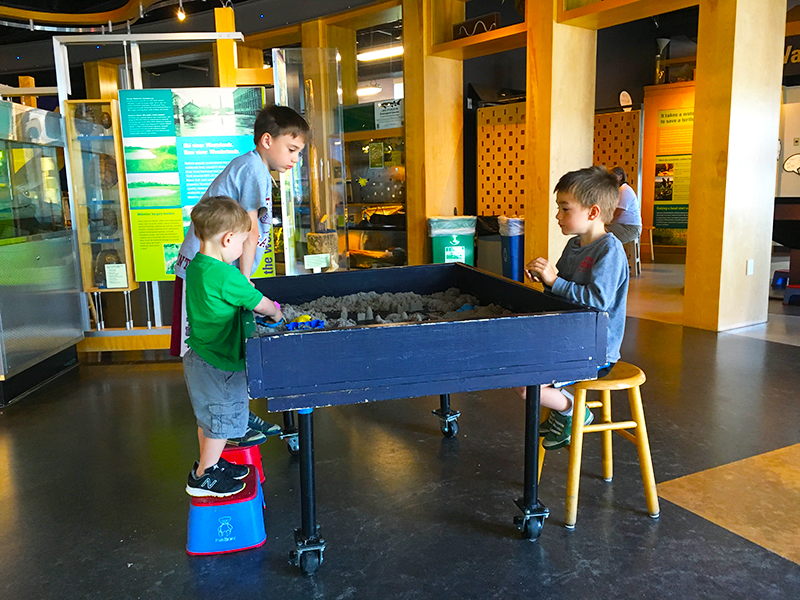 I had been to the ECHO Leahy Center for Lake Champlain once before– a few years ago when we just had the two older boys. We had such a great time, so I wanted to bring all 3 boys back for a visit! After leaving the Basin Harbor Club, we headed north to the center for a morning of learning and lots of hands-on fun! Located right on Lake Champlain, the ECHO is a great spot to take adults and children of all ages. Focusing on the ecology, culture, history and stewardship of the Lake Champlain Basin, this educational gem will keep you and the kids quite busy for a few hours! The ECHO Center is open year-round from 10 a.m. – 5 p.m. (closed only on Thanksgiving, Christmas Eve and Christmas Day). Admission is free for ECHO members. Toddlers (ages 2 and under) are also free. The cost for adults is $14.50 and seniors and students are $12.50. There is a parking lot directly behind the ECHO– just use the 2 self-serve kiosks to pay the small fee. A beautiful view of Lake Champlain from the Outside Deck! 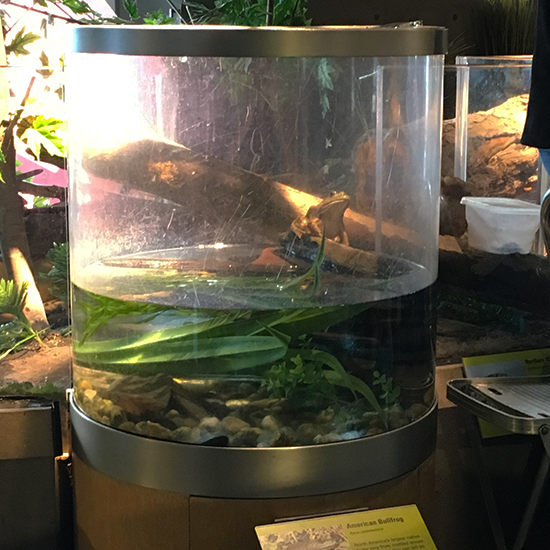 We timed our arrival for 10:30 a.m., so we could catch the amphibian and reptile feeding (this was a must-see for my oldest!). 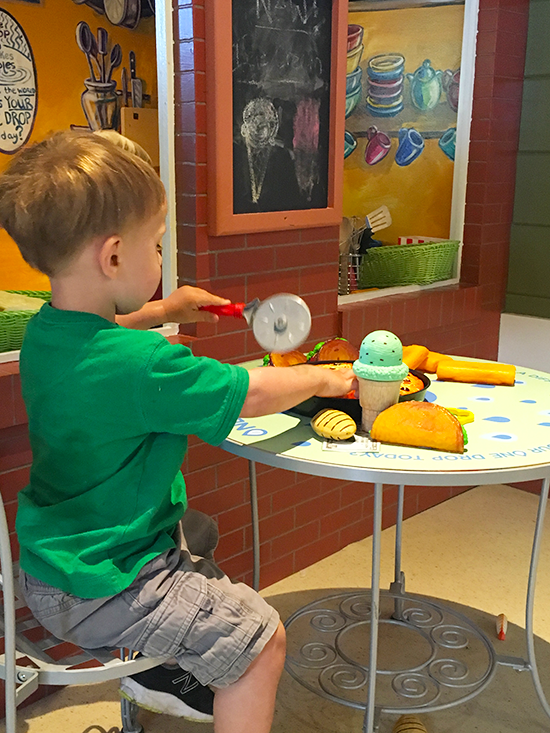 The employees who work at the ECHO Center and give the feeding demonstrations are so knowledgeable and great with kids too– the boys loved it! We got to see this bullfrog eat a meal! In addition to the live demonstrations, there are exhibits on the different aquatic life that live in Lake Champlain, weather in the area, an action lab, exhibits on indigenous groups in the region, and MANY hands-on activities for children including Champ Lane (and AWESOME area for ages 0-6 with a working market, ship, café and veterinary hospital. The boys would have stayed in that exhibit for hours! Having fun in Champ Lane! If you are into shipwrecks, the Into the Lake exhibit is also very cool. You can meander through a life-size replica of the sunken General Butler (a ship that sank in Lake Champlain in 1876) and learn about Champ, the legendary serpentine lake creature! 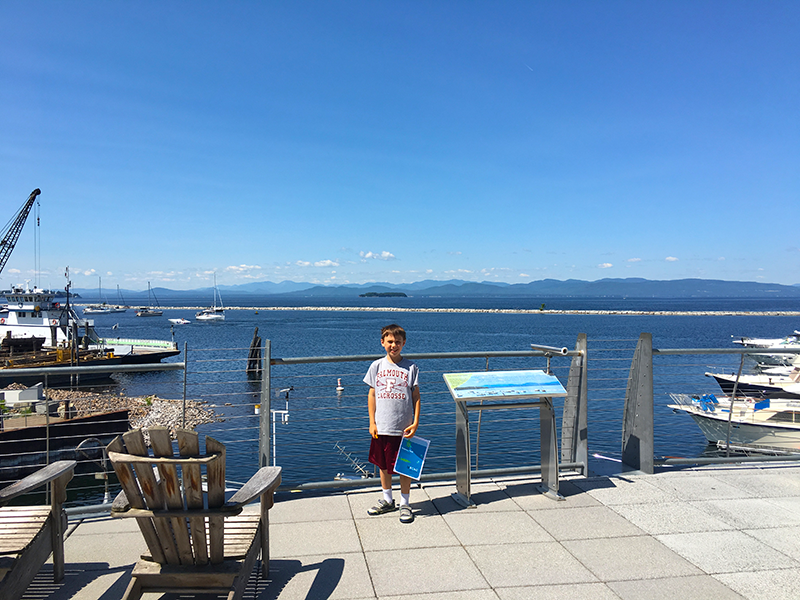 Whether you are planning to visit Burlington (or just passing through) with the kids, I would DEFINITELY recommend checking out the ECHO Leahy Center for Lake Champlain! Previous Post: « We Tried Blue Apron, and Here’s What We Thought!